Presto! BizCard Xpress is the ideal tool to keep your contacts connected ! Do you have piles of business cards and you can't find the right one when you need it? Are you tired of feeling like you are playing a card game as you flip through your business cards to find the contact you're looking for? Now there is a way to get your business card contacts organized – Presto! BizCard Xpress provides an easy and efficient process that recognizes your business cards and then directly transfers them to your Address Book. Once they are in your Address Book, your contacts can be automatically synchronized to the iCloud and even to your iPhone and iPad! With the ability to scan, convert and store, BizCard Xpress works with any TWAIN compliant scanner - desktop, sheet-feed or all-in-one printers. BizCard Xpress' quick scan feature triggers instant scanning without the need to go through the settings, and it also works with auto document feeders, which enables multiple cards to be processed at once. And if you already have business card images, simply drag it to the BizCard Xpress at the Menu Bar and the recognition process will be automatically initiated. With NewSoft's SFIT technology BizCard Xpress identifies the name, company, phone number, email, address and more*. Making good on that vow to get your business card contacts digitized and organized couldn't be easier! 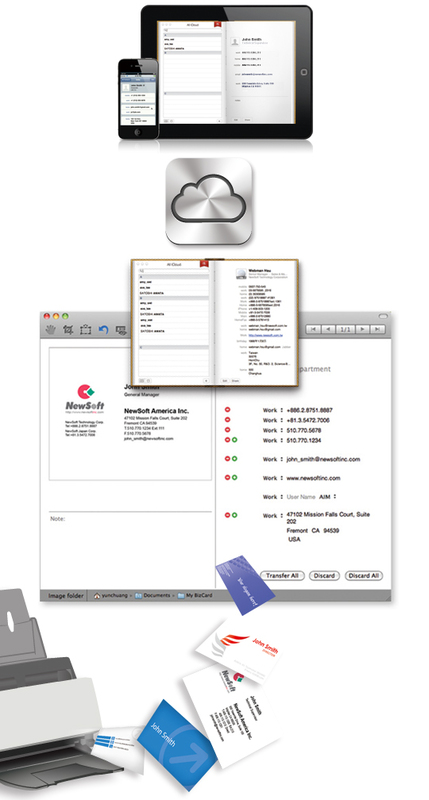 All the recognized data is distributed to the appropriate contact fields, where it can then be exported to Address Book, or to Microsoft Outlook Contacts.Once they are in your Address Book, your contacts can be automatically synchronized to the iCloud and even to your iPhone and iPad! Simply drag your business card images to the BizCard Xpress at the Menu Bar to instantly initiate the recognition process. 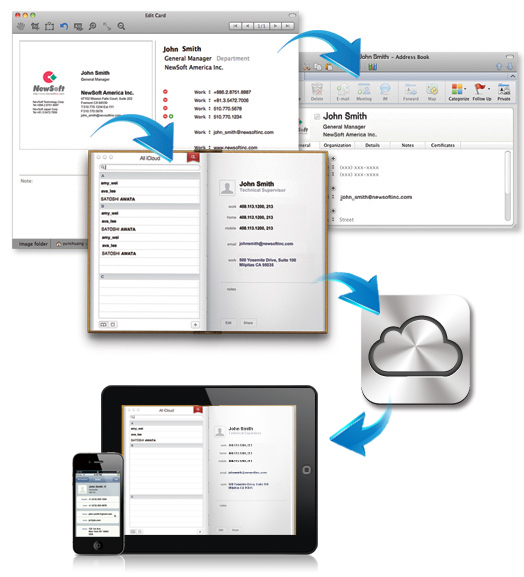 All your scanned business card images will be stored in a specific folder which is customizable. The swift scan-and-cropping module even captures multiple business cards in one scan image from a flatbed scanner, or an all-in-on printer. Recognition languages include: English, Chinese Simplified, Chinese Traditional, Czech, Danish, Dutch, Finnish, French, German, Greek, Hungarian, Italian, Japanese, Norwegian, Spanish, Polish, Portuguese Brazilian, Portuguese European, Russian, Slovak, Swedish and Turkish. The SFIT technology identifies the contact's first name, last name, company, title, and also separates the fields for address, city, state and the zip code. BizCard Xpress supports all TWAIN compliant scanners, with or without ADF (auto document feeder), enabling scanning of single or multi-stacked business cards. The quick scan feature provides straight scanning without complex scanning dialogs. For Intel-Mac (Intel Core Duo processor), Mac OS 10.5, 10.6, 10.7, 10.8, or 10.9 is required. 512 MB RAM (1 GB RAM is recommended). 370 MB free hard disk space for installation, 600 MB free hard disk space to run the application.